General purpose zinc oxide thermal paste improves the heat transfer between adjoining surfaces. Used when mounting thermoelectric (Peltier) modules, temperature sensors, and when attaching objects to cold plates. Non-silicone, exhibits zero bleed. Product weight: 28.4 grams (1 oz. ); each tube will cover approximately 70 (seventy) 40 x 40 mm modules on both sides. 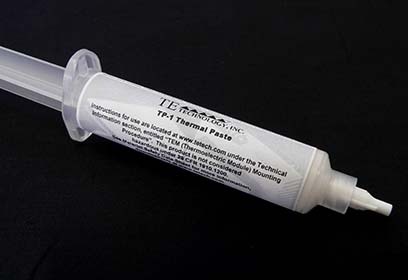 TP-1 Thermal Paste / heat sink compound is an excellent all-around thermal compound useful in aiding the heat transfer between a heat sink and thermoelectric module. Air is a poor thermal conductor, and this thermal paste fills the microscopic air gaps that would otherwise be present between the thermoelectric module and the heat sink/cold plate. A thermal interface material is always needed (except in very rare circumstances) and thermal pastes in general provide the best heat transfer characteristics. Additionally, thermal pastes allow a heat sink and thermoelectric module to expand and contract at their own individual rates, and therefore do not deteriorate system reliability as an epoxy or solder junction can. This compound is also necessary when attaching temperature sensors to heat sinks and cold plates to help ensure the temperature being sensed is as close as possible to the temperature of the object. TP-1 is made from a non-silicone based fluid filled with metal oxides. It has a grease-like consistency, is opaque white in color, and can be applied by spreading with a finger, brushing, wiping or screening. This compound exhibits zero bleed, which means the base fluid will not separate from the paste and creep away from the thermoelectric module over time, even at elevated temperatures. The grain size of the metal oxide provides the right balance between bulk thermal conductivity and gap-filling ability. In other words, it has large enough particles to give it good thermal conductivity and gap filling ability but not so large so that it makes the thermal interface unnecessarily thick. This leads to a low overall thermal resistance between the module and a heat sink. Customers are responsible for testing the TP-1 compound for their proposed use. While the data furnished by TE Technology is believed to be reliable, TE Technology, Inc. does not guarantee the results and makes no warranties as to fitness, merchantability, or suitability of this material for any specific or general use and shall not be held liable for incidental or consequential damages of any kind. Product weight: 28.4 grams (1 oz.). Approximately 0.2 grams of material is required to cover one side of a 40 x 40 mm module, so each tube will cover approximately 70 (seventy) 40 x 40 mm modules on both sides. For instructions on how to mount thermoelectric modules with thermal paste, please see the Thermoelectric Module (TEM) mounting procedure module , available on our website in the Technical information and FAQ’s section.